Faith (Pāli: saddhā, Sanskrit: śraddhā) is an initial acceptance of the Buddha's teaching prior to realising its truth for oneself. It is an important constituent element of all traditions of Buddhism, although the kind and nature of faith changes in the different schools. Other translations of saddhā/śraddhā include confidence and trust. According to received Pali-Buddhist tradition, some of the first words voiced by the Buddha after resolving to teach Dharma were, "Wide opened is the door of the Deathless to all who have ears to hear; let them send forth faith [saddhā] to meet it." when you yourselves know: 'These things are good; these things are not blamable; these things are praised by the wise; undertaken and observed, these things lead to benefit and happiness,' enter on and abide in them. Even though one's own experience and judgement is emphasized in accepting Buddha and Buddhism, one should also heed to the counsel of the wise, meaning a Buddha or a Buddhist teacher well versed in the Buddhist teachings. In the Canki Sutta, the Buddha points out that people's beliefs may turn out in two different ways: they might be genuine, factual and unmistaken or vain, empty and false. Thus, when a person holds a certain belief, they should not derive the conclusion "Only this is true, anything else is false." but instead preserve the truth by commenting on a belief with "This is my belief". The remainder of the sutta discusses how to attain truth by direct experience. Faith is only an initial trust in the Buddha as a spiritual teacher and an initial acceptance of the Buddha's teachings. By listening to the teachings and putting them into practice, a Buddhist disciple can examine through direct experience whether they are true or not. In the Cula-hatthipadopama Sutta, the Buddha describes the path of enlightenment as starting with faith in the Buddha, but continuing by practicing the path of virtue, meditation and wisdom, culminating in the achievement of enlightenment. And wisdom is my yoke and plough. Mindfulness my ploughshare and goad. By comparing faith to a seed, the text indicates that faith is only a preliminary element of the spiritual path. Unwavering faith in the Awakened One, in the Dhamma, and in the Sangha are three out of the four factors that lead towards stream-entry. Buddhists put faith in the reliability of the Buddha as a truly awakened spiritual friend and faith, conviction and confidence in the three jewels (Pali: Tiratana, Skt. : triratna). Faith in Buddhism is expressed in the act of taking refuge. In this, it centres on the authority of Buddha as a supremely awakened being, by assenting to his unsurpassed role as teacher of both humans and gods. It also honors the truth of his spiritual Doctrine (Pali: dhamma), and accepts the community of spiritually developed followers (Pali: saṅgha). Faith in Buddhism can be said to function as a form of motor, which propels the Buddhist practitioner towards the goal of awakening (Pali: bodhi) and nirvana. When a person decides to give up domestic life and live as a monk or nun, it is said to be out of faith "through faith in the Lord". First comes the "hearing"  of the Buddhist teachings (Dharma) and then the aspirant puts these teachings and instructions into practice due to his faith, reflecting upon the value of their application. The ariyan [noble] disciple is of faith; he has faith in the Awakening of the Tathagata [Buddha], and thinks: He is indeed Lord, perfected one, fully Self-Awakened One, endowed with right knowledge and conduct, well-farer, knower of the world(s), matchless charioteer of men to be tamed, teacher of devas [gods] and men, the Awakened One, the Lord. In Buddhism blind faith is not regarded highly. In the Pubbakoṭṭhaka Sutta, Buddha questions Sariputta to which Sariputta answers, "Herein, O Lord, I do not follow the Exalted One out of faith. Those by whom this is unknown, unseen, uncognized, unrealized and unexperienced by wisdom, they will herein follow others out of faith." In other words, in blind faith there is no knowledge or conviction, and one can have blind faith in anyone and such blind faith never leads to wisdom and true conviction. Only the actual experience of regular practice can lead to true faith and conviction born out of realization. "But those by whom this is known, seen, cognized, realized and experienced by wisdom, they have no uncertainty, no doubt about it that these five faculties, if cultivated and regularly practiced, lead to the Deathless, are bound for the Deathless, end in the Deathless." faith in the reality of the enlightenment of the Lord Buddha (Pali: tathāgatabodhisaddhā). The Pāli suttas (scriptures) list faith as one of seven treasures (Pali: dhana), one of five spiritual faculties (Pali: indriyas), one of four "streams of merit", and one of the spiritual powers (Pali: balas). In general, the role of faith in Mahāyāna Buddhism is as strong as that of the Theravādin. Moreover, the depth and range of faith may be perceived as being intensified, particularly according to the Buddha nature (tathāgatagarbha) sutras and the Pure Land literature. If any living beings who seek after the Buddha-way either see or hear this Law-Flower Sutra [i.e. the Lotus Sutra], and after hearing it believe and discern, receive and keep it, you may know that they are near perfect enlightenment. Thereby do enlightening beings [bodhisattvas] first rouse their will. Revealing the unsurpassed road of ultimate peace. And reveal the unsurpassed road of liberation. Faith can grow the seed of enlightenment. We say that unsurpassed awakening [bodhi] has faith as its cause. The causes of awakening are innumerable, but if stated as faith, this covers everything. There are two kinds of men: one who has faith, and the other who has not. O Bodhisattva! Know that he with faith is one who is good, and that he who has no faith is one who is not good. Faith arises out of listening to Dharma, and this listening is [itself] grounded in faith. First, he [i.e. the Bodhisattva] is perfect in faith. How is faith perfect? 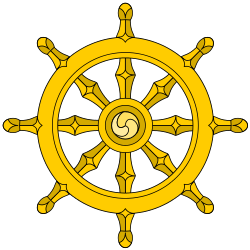 This is believing deeply that the Buddha, Dharma and Sangha are Eternal, that all Buddhas of the ten directions [= everywhere] make use of expedients [effectively to convey Dharma to the different types of being], and that beings and icchantikas [= the most spiritually depraved of persons] all possess the Buddha-dhatu [Buddha-Principle, Buddha-nature ]. It is not believing that the Tathagata is subject to birth, old age, illness, and death, that he has undergone austerities, and that Devadatta [= Buddha's cousin] really caused blood to flow from the Buddha's body, that the Tathagata ultimately enters Nirvana [= finally dies], and that authentic Dharma dies out. This is where we speak of the Bodhisattva's being perfect in faith. If a person does not possess faith and insight [prajñā], such a person increases his ignorance. If a person possesses insight, but not faith, such a person will increase [his or her] distorted views. ... A person who has no faith will say, out of an angry mind: "There cannot be any Buddha, Dharma, and Sangha!" Linji Yixuan said that if a person were to adopt perfect self-confidence (faith in themselves) they would attain enlightenment in an instant. In The Three Pillars of Zen, Haku'un Yasutani says something similar. He explains that in Shikantaza one should sit naturally but be overwhelmed by his faith in his Buddha-nature and the efficacy of the meditation process. After weeks, months or years of training the meditator will have a moment of enlightenment characterized by mania and an inability to sleep for several days. This will subside and the individual will be able to return to everyday life but be changed for the better. No sravakas [the elementary students of the Buddha] or pratyekabuddhas ["private" Buddhas, who usually avoid people and generally do not teach] are able to know, see or investigate this matter with their insight. How much less able to do so are foolish ordinary people, except when they directly realise it by faith! Faith is thus presented as a powerful means for Buddhist practitioners to penetrate through to, and realize deep spiritual truths for themselves. O Śāriputra, the ultimate truth is really approachable only by faith [in the Tathāgata]. O Śāriputra, the ultimate Truth is a synonym of the mass of living beings (sattva-dhātu). The mass of living beings is, O Śāriputra, nothing but a synonym of the Matrix of the Tathāgata (tathāgatagarbha). The Matrix of the Tathāgata is, Śāriputra, nothing but a synonym of the Absolute Body (dharmakāya). If anyone, when this deep perfection of wisdom is being preached, feels respect, affection, and serene faith for it, then he feels respect, affection and serene faith also for the Buddhas and Lords of the past, future, and present. Those born in the Western Land are of nine grades. Those who attain birth on the highest level of the highest grade are sentient beings who resolve to be born in that land, awaken the three kinds of faith and so are born there. What are the three? They are, first, the sincere faith, second, the deep faith; and third, the faith that seeks birth there by transferring one's merit. Those who have these three kinds of faith will certainly be born there. Furthermore ... if there is a good son or good daughter, whether having already heard this, or shall hear it, or who is now hearing it – once hearing this Sutra, profoundly is there born an understanding faith. Once there is born an understanding faith, a certainty about the accumulations of merit residing in the ten directions with the Buddha World-Honoured Ones, whose number is like the sands of ten River Ganges, and they practice as instructed, all will be firmly in the supremely unexcelled Bodhi. This teaching of faith, originally advocated in conjunction with discernment and Dharmic practice, received a new interpretation in the teachings of the Japanese Buddhist saint, Shinran Shonin (1173–1262 CE), who taught that just one recitation of the mantra, "Homage to Amida Buddha", with deep faith, would be enough to secure the faithful person entrance into the Western Paradise. Subsequent utterances of that formula would be expressions of gratitude to Buddha Amida (Amitabha). Deep understanding of the Buddha's teachings and Buddhic practice were not necessary, Shinran claimed. This interpretation of the "Pure Land" sutras represents perhaps the zenith of faith-oriented Buddhism and remains controversial, although Shinran's school of Jodo Shinshu is today perhaps the largest Buddhist sect in Japan. When wood is kindled by fire, fire does not leave it. The wood is likened to the mind of one who practices the Way; the fire is likened to the Light of Embracement of Amita. Shone upon and protected by the spiritual light, there can be no Buddha-Mind other than one's own and no mind of one's own other than the Buddha-Mind. This is called "Namuamidabutsu" ["Homage to Amita Buddha"]. By the power of faith, we are able to eliminate the two types of obscurations. Through the power of faith both ontological and phenomenological knowledge arises. It is also by the power of faith that both the common and uncommon siddhis arise. Not to be given to those who are not suitable vessels. This injunction pertains to teaching Mahāyāna, Vajrayāna, and to Atiyoga in particular. Those without faith who are completely involved in the eight mundane concerns are not suitable vessels, and they should not be taught these kinds of Dharma. As we sat next to the river, many members of the group used their own methods to see whether we would go or not... This was a very interesting moment in the pilgrimage, because the practice of Chod is all about attachment and the demons of hope and fear. Here we were on the bank of this river, close to Machig's place and thus full of hope, yet the rushing water told us death was a real possibility if we tried to cross. I decided to relax completely and to allow Machig to help us, and if that meant staying at camp, that was okay. I saw that faith is a form of relaxation, and this turned out to be one of the most powerful realizations of the pilgrimage for me. Faith is taking things one step at a time, relaxing, trusting. It is moment-to-moment opening to the wisdom beings. In the Mahayana tradition, lack of faith (āśraddhya) is defined as a mental factor that is characterized by a lack of trust, and lack of interest in, or desire for, wholesome things. Āśraddhya is identified as one of the twenty secondary unwholesome factors within the Mahayana Abhidharma teachings. ↑ Mahavagga, I, 5,11; Vinaya Texts, T. W. Rhys Davids, Motilal Banarsidass, Delhi 1996, p.88. ↑ Cf. Giustarini G. (2006). "Faith and renunciation in Early Buddhism: saddhā and nekkhamma", Rivista di Studi Sud-Asiatici, I, p. 162. ↑ "Hearing" is a rendering of one of the indivisible "mūla-prajñā". ↑ e.g. Dīgha Nikāya III.163, Estlin Carpenter J. (ed. ), The Dīgha Nikāya, Pali Text Society, London 1976, p. 163. ↑ "The Threefold Lotus Sutra". Risshō Kōsei Kai. Retrieved April 2, 2015. ↑ Cleary, Thomas (1993).The Flower Ornament Scripture: A Translation of the Avatamsaka Sutra, Boston and London, Shambhala, pp. 331-332. ↑ Yamamoto/Page, Chapter 20, "On Holy Actions". ↑ Yamamoto/Page, Vol. 5, Chapter 21, "On Pure Actions" (a), p. 3. ↑ Yamamoto/Page, Vol. 8, Ch. 34 "On Bodhisattva Lion's Roar" (b), p. 44. ↑ Yamamoto/Page, Vol. 9, Chapter 38, "On Bodhisattva Lion's Roar" (f), p. 33. ↑ Takasaki, Jikido (1966). A Study on the Ratnagotravibhāga (Uttaratantra) Being a Treatise on the Tathāgatagarbha Theory of Mahāyāna Buddhism (Rome Oriental Series 33). Rome: Istituto Italiano per il Medio ed Estremo Oriente. ↑ Conze I, 18,000-Line Prajnaparamita Sutra, p. 484. ↑ Source: Faith in Buddhism (accessed: Wednesday March 25, 2009) Archived December 29, 2008, at the Wayback Machine. The obscuration of conflicting emotions ([Wylie:] nyon-mongs-pa'i sgrib-ma, Sanskrit: kleśa-varaṇa) and the obscuration concerning the knowable ([Wylie:] shes-bya'i sgrib-ma, Sanskrit: jñeyāvaraṇa). Dorje, Jikdrel Yeshe (Dudjom Rinpoche, author), & translated and edited: Gyurme Dorje and Matthew Kapstein (1991). The Nyingma School of Tibetan Buddhism: Its Fundamentals and History. Boston, USA: Wisdom Publications. ISBN 0-86171-199-8, p.107 (Enumerations). ↑ Source: (accessed: Wednesday March 25, 2009) Archived December 29, 2008, at the Wayback Machine. ↑ "Listening" is a literal translation of the first of the three mūla prajñā. ↑ Dudjom, et al.render the "eight worldly concerns" (Wylie: jigs-rten chos brgyad; Sanskrit: aṣṭa lokadharmāḥ) into English, thus: profit, loss, pleasure, pain, fame, defamation, praise and blame. Source: Dorje, Jikdrel Yeshe (Dudjom Rinpoche, author), & translated and edited: Gyurme Dorje and Matthew Kapstein (1991). The Nyingma School of Tibetan Buddhism: Its Fundamentals and History. Boston, USA: Wisdom Publications. ISBN 0-86171-199-8, p.162.